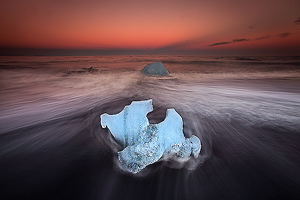 An unique opportunity to visit Iceland in winter conditions with local winter and Aurora photography expert Örvar Þorgeirsson and renown photography workshop leaders Jack Graham and Greg Duncan. 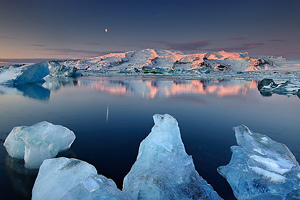 We will see Iceland in different conditions than most have as frozen snowy landscape has taken over. We have chosen January for the tour as it offers great midwinter light during the day and good chances of Aurora at night. With only 5 seats available this is a tour for the serious landscape photography enthusiast that wants expert guidance in a small group of like minded people. We will sacrifice rest and comfort to get the best pictures possible and the small group size will enable us to adapt our shooting plan and go with the light as it chances. Single occupancy accommodation for 5 nights including 1 nights in Reyjavík at the end of the trip incl breakfast. 4×4 transportation and airport pickup. Mountain guide services for the ice caves. Örvar Atli Þorgeirsson: Mountain adventurer since his teenage years. On his many trips to the Icelandic mountains and wilderness the photographer became obsessed with capturing the raw beauty of the places he visited. 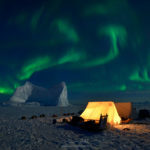 Over the years he has captured Iceland’s most wild places on his camera from the colorful and never-ending midsummer arctic sunset to the inspiring displays of northern lights in winter. Runs a photo gallery in down town Reykjavík, Iceland. Jack Graham: An professional photographer with over 23 years of experience. Jack resides near Portland Oregon, in the heart of the beautiful Pacific Northwest. 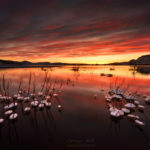 For 18 years, Jack has led photo workshops in California, Wyoming, Utah, Iceland, Canada, Arizona, the Midwest as well as the Pacific Northwest. as well workshops for the Pacific Northwest Art School on Whidbey Island,Washington. 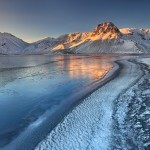 Winter is a time of year to move with the light and conditions more so than summer in Iceland. 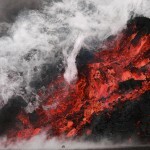 We will visit specific locations according to conditions. 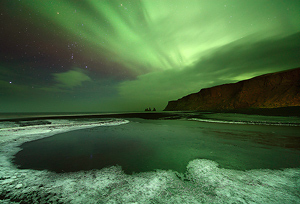 The January winter season can be stormy in Iceland. This makes for great imagery and is part of the allure and adventure of this trip. Temperatures are usually not that low as one may expect considering the latitude. Average temperatures are just below freezing. Some days with thaw and rain can be expected as well.. The absolute minimum temperature will be -15°C (-5 f) but a typical clear winter day is about -5°C (25 f ). The wind however makes the temperature feel colder. Being dressed with wind protection is important. We will inform you on specific clothing to use. We will not be doing any long hikes on this trip. Most locations are withing 15 minutes walk from the car. 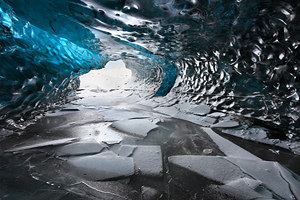 Access to some locations specially the ice caves although short, might include rough terrain but we will be assisted by a professional mountain guide in this case. Complete safety equipment ( helmets etc) are supplied by our guides. Slippery surfaces can be expected throughout the trip but we will send you recommendations regarding footwear for this trip. We will be adjusting the itinerary according to conditions. But these are the locations we will be visiting. In cold conditions the numerous waterfalls will be frozen chandeliers of icicles. 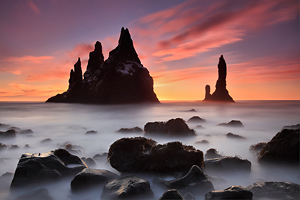 The Vík area in whole has it best light of the year in winter when the mid winter sun sets into the sea behind sea stacks and arches. 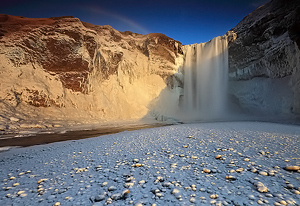 Skaftafell as a part of Vatnjökull nation park is a winter wonderland where glaciers run down high volcanoes in their blue winter coating. 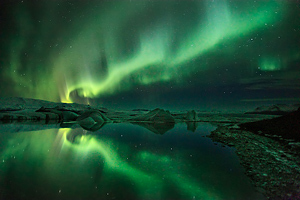 An ideal location for shooting Aurora if it appears. Jökulsárlón and other glacier lagoons. 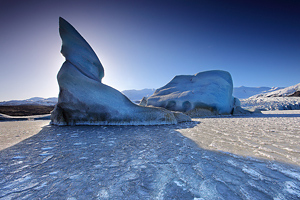 The magical Jökulsárlón glacier lagoon is a different place in winter. 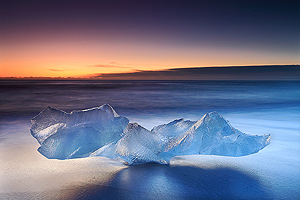 The frozen lagoon along with it now blue ice bergs always comes up with new ways to be photographed and each session there is different than the previous. 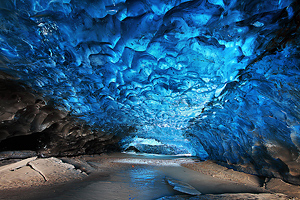 The true magic of glaciers lies underneath them. 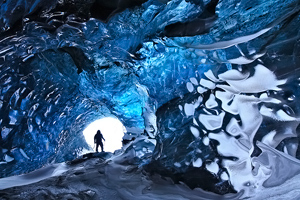 Assisted by a local mountain guide we will explore this wonder world of blue textures and structures. The photogenic black lava sand beach below Jökulsárlón where ice bergs that get washed out from the lagoon pile up has it best light in mid winter. 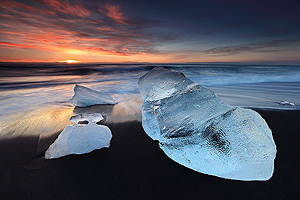 Just like Vík the beach will have sunset and sunrise into the sea and it will provide nice light behind the icebergs.